One of the secrets behind the secret speech is that Nikita Khrushchev never intended to keep it under wraps. He made it behind closed doors only to placate Kremlin hardliners, who feared a public address would ruin Stalin's reputation. But the secret speech, made to the communist elite at the 20th party congress, was a tactical move. Once the elite was informed, Khrushchev was free to act even more boldly. "My father want to tell about this all this to all the people, to all Soviet people. There's no reason to keep it secret," says Sergei Khrushchev, Nikita Khrushchev's son. He said his father wanted to publicize the speech to gather rank and file support for his fight against pro-Stalinists who opposed his change of course. "We cannot keep it secret from the members of the communist party. We have to read to the members of the communist party. After that, he told, but we have our communist youth, and they have to know truth." In the weeks following his secret speech, Nikita Khrushchev ordered tens of thousands of communists, young and old, to gather at meetings where they were read the text of his remarks denouncing Stalin. The word was out. All Russia knew. 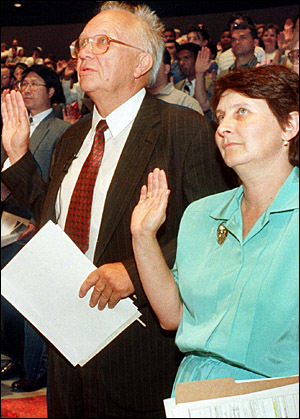 Sergei Khrushchev, son of Nikita Khrushchev, and his wife, Valentina Galenko, are sworn in as U.S. citizens, July 12, 1999. Sergei Khrushchev was born in 1935, reared during World War II, and came of age during the post-war era, a proud time for the Soviet Union, which had become a world power. He was close to his father, and witnessed with him some of the most interesting moments of cold war history. The Berlin Wall. Yuri Gagarin, the first man in space. This scene at the United Nations in 1960, in which an animated Nikita Khrushchev brandished his shoe and gave the capitalist west a nasty case of verbal whiplash. And there was the Cuban missile crisis, where President Kennedy said, "I call upon Chairman Khrushchev to halt and eliminate this clandestine reckless and provocative threat to world peace." That was October 1962. Nikita Khrushchev was ousted from power two years later by a clique of neo-Stalinists. They said Khrushchev had engaged in bragging, bluster, and hare-brained schemes. A quarter century later, as the Soviet Union began to crumble, Sergei Khrushchev was invited to the United States to lecture about developments in Russia. And on July 12, 1999, the son of Nikita Khrushchev became a United States citizen. "Sixty-four-year-old Sergei Khurshchev pledged allegiance to a country his father detested," said a newscast. "Sergei says he never would have become a U.S. Citizen during the cold war. But in his words, times have changed. 'Because it's different world. We're not living now in the old cold war environment. ' 'That you will support and defend the constitution and laws of the United States of America against all enemies foreign and domestic...' 'Congratulations all of you. I wish you all a good life in America.'" Sergei Khrushchev now teaches at Brown University in Providence, Rhode Island. He is 70 years old and somewhat resembles his father. There's the same twinkle in the eye, the same balding pate. But Sergei Khrushchev lacks the portly face and the overall rotundity his father had, and appears to lack his dad's braggadocio.